Volkswagen remained Europe’s largest carmaker and best-selling brand despite loosing market share in a expanding market at the start of 2016. The European new car market grew by 8.1% to just below 4 million cars during the first three months of 2016. Almost all car manufacturers and marques increased sales but market leader Volkswagen had weaker sales. Ford remained Europe’s second strongest car brand while Opel / Vauxhall recovered third place from Renault. Jaguar was the most-improved brand with sales more than doubling from a year ago. The VW Golf remained Europe’s favorite car model. During the first three months of 2016, all the top car manufacturing groups with the exception of Nissan and Mitsubishi increased car sales in the European Union and EFTA compared to a year ago. However, all the top carmakers underperformed the broader market and thus lost market share in a strongly expanding market. The Volkswagen Group easily remained Europe’s largest carmaker but sales increased by only 3.5% compared to 8.1% for the market as a whole. As a result, the VW Group lost a full percentage market share compared to a year ago – down to 23.4%. The main culprit was Europe’s largest car brand – Volkswagen sales were down by 0.5%, which reduced the marque’s share by 0.9% to 11.1% of the total EU and EFTA market. Audi and Skoda enjoyed strong sales but Seat and Porsche sales were down – the only other brands with weaker sales apart from Nissan and Mitsubishi. The PSA Group similarly underperformed the broader market with all three brands – Peugeot, Citroen and DS – registering weak growth. The Renault Group performed better with Renault sales growing in line with the general market. Ford sales improved just below market average. The Opel Group was the largest European carmaker to have added market share during the first quarter of 2016 with sales up 10.7%. The FCA Group improved even more with sales increasing by 16.3%. In terms of volume, the FCA Group added the largest number of cars with Fiat sales up nearly 30,000 cars. Even Lancia and Alfa Romeo grew during the first quarter of 2016. The BMW and Daimler Groups also outperformed the broader market. 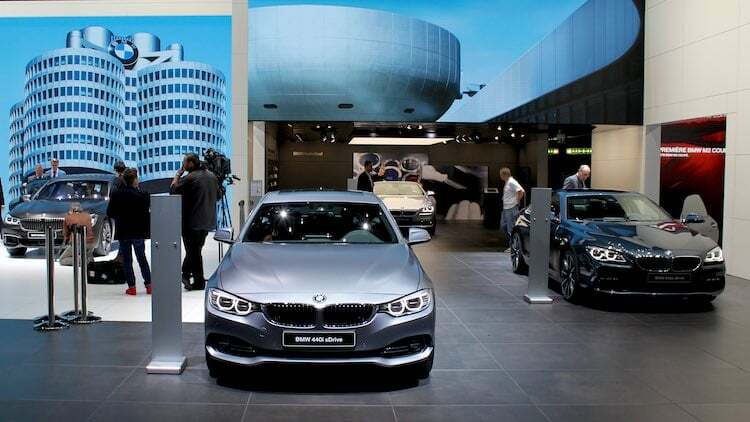 BMW, Mercedes and Audi all improved sales by around 12%. The Toyota Group increased sales by only half the market average, although Lexus increased sales by a fifth. However, with the Nissan Group having weaker sales, Toyota moved ahead of its competitor during the first quarter of 2016. The Jaguar Land Rover Group was the most improved with sales up by 40% – largely due to Jaguar more than doubling sales from a year ago. Volkswagen remained Europe’s top-selling car brand during the first quarter of 2016 but it was the only of the top-ten brands to have had weaker sales. VW sales were down 0.5% for a loss of almost a percentage point in market share. However, VW remained well ahead of second placed Ford that had sales almost inline with the broader market. Opel / Vauxhall outperformed the market and regained third place from Renault that increased sales at the market average. Peugeot sales increased but below market average. Audi, BMW and Mercedes all increased sales by around 12% but Fiat was the most-improved top-ten brand with sales up by nearly 17%. VW-owned Skoda entered the top-ten list by swapping places with Nissan, which is now 12th with Toyota still at eleventh. The VW Golf and Ford Fiesta remained the two most-popular car models in Europe during the first quarter of 2016. However, both models had weaker sales and lost market share in an expanding market. The only top-five car to have increased unit sales was the Volkswagen Polo that swapped rank places with the Renault Clio. The Opel / Vauxhall Corsa maintained its fifth place despite weaker sales. Peugeot 208 sales were much stronger allowing it to move up two places on the list. The Nissan Qashqai remained Europe’s favorite SUV but slipped one rank position despite stronger sales. The Opel / Vauxhall Astra increased two rank position with sales up by nearly a third. The new Astra was a hit in especially Germany. The Ford Focus slipped from seventh to ninth while the Skoda Octavia replaced the Audi A3 as the tenth most-popular car model in Europe during the first quarter of 2016.